Manchester United fans have to camp outside Zlatan Ibrahimovic’s house to persuade him to sign a contract extension at Old Trafford, Jose Mourinho advised after the Swede’s brace decided the League Cup final on Sunday. The 35-year-old striker unleashed a sublime free kick in the first half and then powered in a late headed winner to seal United’s 3-2 victory over Southampton, taking his tally for this season to 26 goals across all competitions. Mourinho’s decision to bring in Ibrahimovic, who he worked with at Inter Milan, has proved a brilliant one and the Portuguese wants to have him for at least one more season, although Ibrahimovic is rumoured to be weighing up his options. “I never beg a player to play for me,” Mourinho, who now has a joint record four English League Cup trophies to his name, told reporters. “One day he decided to go to Barcelona, and I was very sad but did nothing to try to stop him to go. 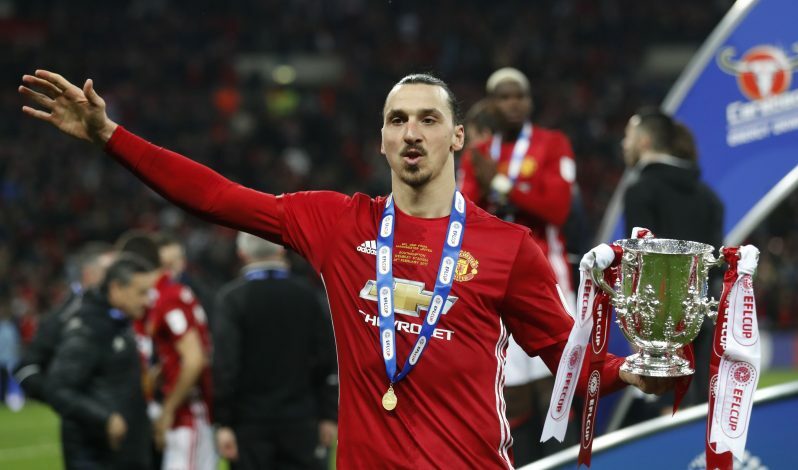 Mourinho also insisted he never doubted that Ibrahimovic, who has now won silverware in five countries, would adjust with the demands of the English football at such an advanced stage of his career. “I was his manager (at Inter), I knew the potential,” Mourinho, said. “Only a silly player comes to England at 35 years of age and with the successful career he has had.